Protecting your home and family is a top priority when choosing security equipment. There are a variety of security devices that will improve your level of home security. Home burglaries are on the rise in most cities. It is important that you take the steps to heighten your home security plan. The first step is to make a home security plan that meets your family’s needs. A security plan will help you choose the devices that suit your lifestyle. Surveillance cameras are often used to monitor the outside of your home. These cameras are typically placed at entry points into your home. 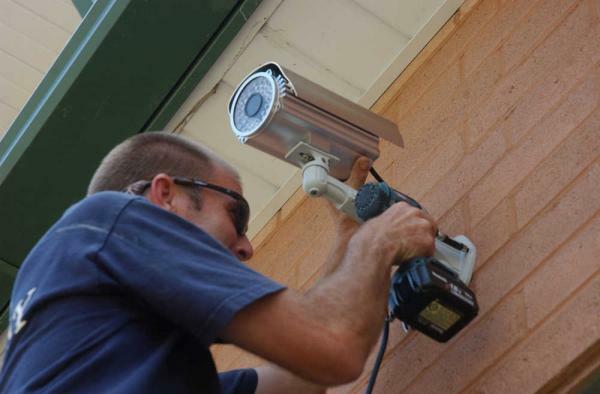 You can choose a wired or wireless surveillance system that can accommodate several cameras. The type of camera you choose will depend on your budget and security needs. Determine whether you want the cameras to record all the time or just when it detects movement. A surveillance camera with motion detecting capabilities will reduce your need for extended storage space on your DVR. It is easier to monitor a camera with motion detectors and saves time. Home security alarms are the most popular way to keep an eye on your home. The sensors are placed on windows and doors and will sound an alarm if disturbed. You can choose to monitor your alarm system on your own or hire a professional company. The benefits to hiring a professional company is the fact that you get 24-hour monitoring. It is difficult for anyone to monitor their home every moment of the day. Choose an alarm company that offers low monthly rates and the latest in home security equipment. If you want to save money, you should purchase your own system and monitor your home. Home security systems are inexpensive and cost much less than the results of a home invasion. If someone breaks into your home, you are likely to lose your electronics, jewelry and guns. You should keep your jewelry and guns in secure locations that lock. With the price of gold on the rise, jewelry is a hot commodity for a thief. The common intruder can sell a piece of jewelry for quick cash. It’s the same with electronics and guns. Intruders are looking for anything they can sell easily. These items also include expensive sporting goods, computers and smartphones. Your home should not have the curtains or draperies opened where it is easy to see what’s inside your home. Many potential intruders walk through neighborhoods looking for an easy home for their next target. Install security signs around your doors and windows letting potential intruders know that your home is monitored. Even if you don’t choose a monitoring company, you can purchase these stickers online. If you have a tight security budget, consider installing fake surveillance cameras. These cameras look like the real thing and the common intruder won’t know the difference. Today’s technology has vastly improved the security industry. It is possible to check on your home using your smartphone. Advanced technology has also improved the images produced by surveillance cameras. You can buy a security camera that can record in conditions that have no light available. Night vision cameras are a popular type of camera for people who want their cameras to record undetected. It is also easier to monitor your images on your computer, tablet or smartphone. The price of security systems have dropped to affordable rates the past few years. You can easily purchase a security system for your entire home for less than $600. It is important that you speak with a professional home security expert before you buy your equipment. You will waste money if you purchase security devices you don’t need. These security experts will ask you specific questions about your home and match your needs with the right devices. Personal security tips should be used anytime you leave your home. You should always be aware of your surroundings. Listen to your intuition if you feel someone is following you or is otherwise suspicious. Report suspicious people to your local law enforcement office. It is better to trust your instincts than to become a crime victim. Criminals often look for people who are busy and distracted. Stay off your cellphone or smartphone when walking alone in a parking lot. No matter where you live you should follow safe security practices. Don’t go shopping at night by yourself. Many carjackings occur at night and in parking areas. If you drive one of the top stolen cars, you could become a victim of a carjacking. It is important that you remain calm in any type of situation that results in a threat to your security. Consider taking self-defense classes to prepare yourself for potential threats. When you go on vacation to an area that is unfamiliar, you should research the area before you leave. Many people are a victim of crime while on vacation because they simply think they are safe. It is important that you know which areas are high-crime areas. Unsuspecting tourists have fallen victim in these types of areas in a city simply because they didn’t know the area. If you are lost while on vacation, ask for directions at a place that is well-lit and populated. Not all taxi drivers in every city are safe methods of transportation. Some taxi drivers are not associated with well-known taxi services and you could be subject to robbery. Use only taxi services that are known nationally. Don’t walk around alone in an unfamiliar area even if it is a top resort. When you travel out of the country, research your destination carefully. The Internet makes it easy to find information about crime statistics and places you should avoid. Vacation time should be a time for fun and relaxation. Follow common security practices to avoid becoming a victim of crime. Use the Internet to find out key information about places you wish to visit on vacation. Contact us today for a free security system consultation.